The BOSS Mashup Framework is an experimental Python library that provides developers with SQL-like constructs for mashing up the BOSS API with third-party data sources. The library exposes data constructors that will "best effort" unify response formats regardless of their XML, JSON, RSS/RDF structures. In this paradigm, the developer does not need to specify the parsing and conversion logic per data source, resulting in concise, declarative and simple-to-interpret code. In less than 15 lines of code, one can search for "iphone" in Yahoo! 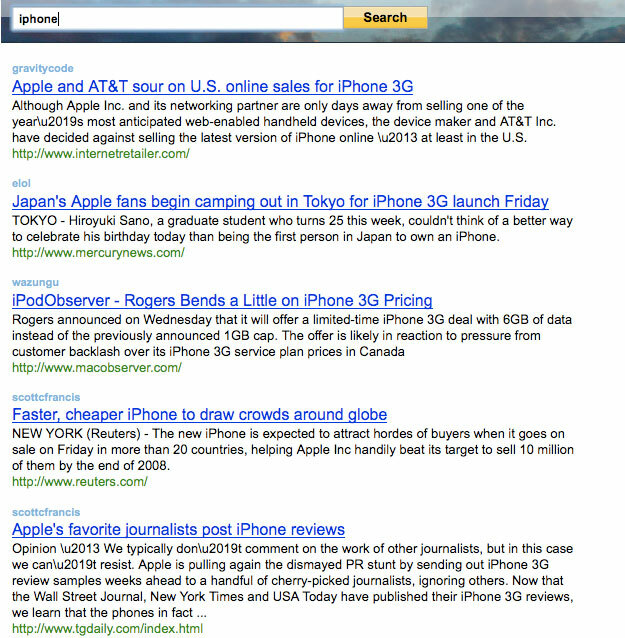 News and overlay over each result a related result from the del.icio.us popular feed, and display the combined results in a provided search results page template. Will Larson has shared a number of useful Python libraries and other resources he developed. Check them out here. We hope the mashup framework is a useful tool for developers using the BOSS API. Please let us know if you have any feedback or suggestions by emailing us: bossfeedback AT yahoo-inc.com.